Soup is comfort and love in a bowl. Whenever I visited my parents, one of my mother’s many loving offerings included homemade soup. Today it was my turn to make the offering. My darling came home early from work with a low grade fever and headed straight for bed. I needed to get him some nourishment pronto. It needed to be easy to digest and quick to prepare. A quick assessment of our inventory revealed the usual staples on hand: chicken broth, ramen noodles, eggs, garlic, ginger, scallions and carrots. A fortuitous supply of bok choy, Napa cabbage and shiitake mushrooms left over from another meal spelled out “ramen soup” in my head, in flashing neon lights. I quickly ran off to purchase a store roasted chicken. About 40 minutes in the kitchen later, I offered him love in a bowl. My version of Easy Ramen Chicken Soup uses both prepared broth and dried seasonings. Traditional Japanese ramen uses fresh noodles and the broth is created over many hours from ingredients like kelp, chicken or pork. Korean style ramen uses dried noodles and dried powdered seasoning. I love both styles so I took a short-cut, combining a bit of both and used a Chinese 5-spice powder. Please forgive me. Remove the chicken wings and set aside. Remove the meat from the thigh and leg, and set the bones aside. Careful, the chicken will be hot internally. In a medium pot, combine the wings, bones, broth, soy sauce, onions, ginger, garlic and 5-spice. Bring to a boil, then lower to medium-low heat and simmer for about 30 minutes. In another medium pot, bring water to a boil. Add the rinsed eggs and boil for about 7 – 9 minutes. (I prefer a 7 minute softer boiled egg.) You will want to rinse the eggs before because they will be cooking in the same boiling water as the ramen noodles. Cook the noodles according to package instructions, timing it so the eggs and noodles finish cooking at the same time. For example, the ramen noodles I purchased needed only 4 minutes to cook. So added the eggs to the boiling water and set the kitchen timer for 3 minute. After the eggs cooked for 3 minutes, I added the noodles, and set the timer for an 4 additional minutes. Once the eggs and noodles are cooked, remove the eggs and place them in cold water. This will make it easier to peel the egg shell. Using tongs, portion out the noodles into individual large bowls. Rinse out the pot and set it aside to use again. If you are on a gluten-free diet, I recommend this millet and rice ramen noodle brand. Prepare the vegetables and finish slicing the chicken meat while the broth simmers. Place the chicken on top of the noodles. Remember, a serving size of protein should be the size of a deck of cards (about 3-4 ounces). I tend to consume about 2 ounces or less for myself or I just omit the chicken since the egg is a source of protein. Peel the eggs and slice in half. Place two halves in each bowl. Once the broth has been simmering for about 30 minutes, turn off the heat. Place a fine meshed strainer over the empty pot used to boil the noodles and eggs. Carefully ladle the very hot broth over the strainer, transferring all the broth to the other pot. I like to pick out the onions and throw them back into the broth. You might find some good little pieces of chicken meat to toss back in too. Discard the bones and other solids. Carefully taste the hot broth and adjust the seasoning. You might be tempted to add a little hot chili oil or sriracha sauce too. Turn the heat back on to bring the broth back to a simmer. Toss in the grated carrots, greens and mushrooms. Stir and simmer for 2 minutes to soften the vegetables. Ladle over the noodles and chicken. Top with sliced green onions. Deliver with love. It’s just another early morning workout and I’m starving for a fast and warm breakfast. I happen to have a extra unopened can of pumpkin puree left over from Thanksgiving. Pumpkin is a nutrient dense fruit so I decided to add it to my slow cooker oatmeal routine. 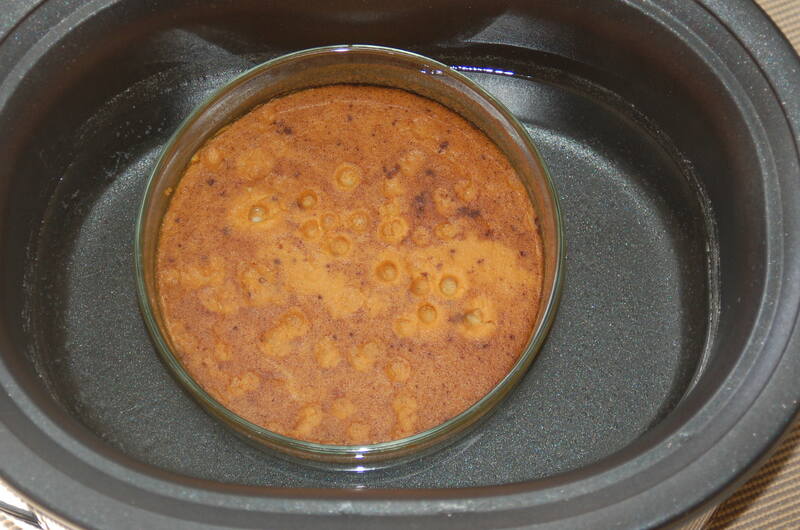 Unfortunately, the first attempt resulted in some unsavory burned pumpkin oatmeal on the edges of the slow cooker. In my second attempt, I turned my slow cooker into a double boiler. This yielded perfectly cooked, unburned oatmeal. 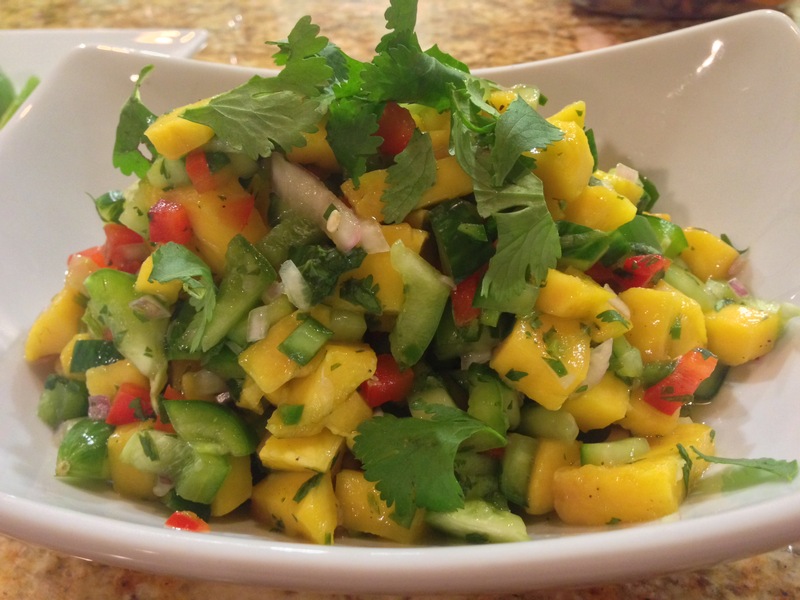 Before I share this recipe, allow me to entertain you with a little Hungry Athlete story. Clearly the ladies were having fun with me and I lived to write this recipe, however the moral to the story is to plan your trail runs better. Don’t get caught on the trails before they close. Carry ID and your cell phone so you don’t have to accept rides from strangers and live to enjoy Pumpkin Oatmeal in the morning. * Note: Ideally, if you can do without the dark brown sugar, that is the healthiest option, but I personally prefer to have a small amount of it in my oatmeal. Since this recipe is a serving size for 4, one tablespoon isn’t so bad. I sometimes enjoy my pumpkin oatmeal with a diced raw apple or a sliced banana, which adds a natural sweetness to the oatmeal. I found that by weening myself off of sugar, I can adapt to enjoying foods like oatmeal and coffee without sugar. Whisk all of the ingredients together and pour into an oven proof glass bowl that will fit inside the slow cooker. I used a 6.5 quart slow cooker but a smaller 4 quart slow cooker is all you need. 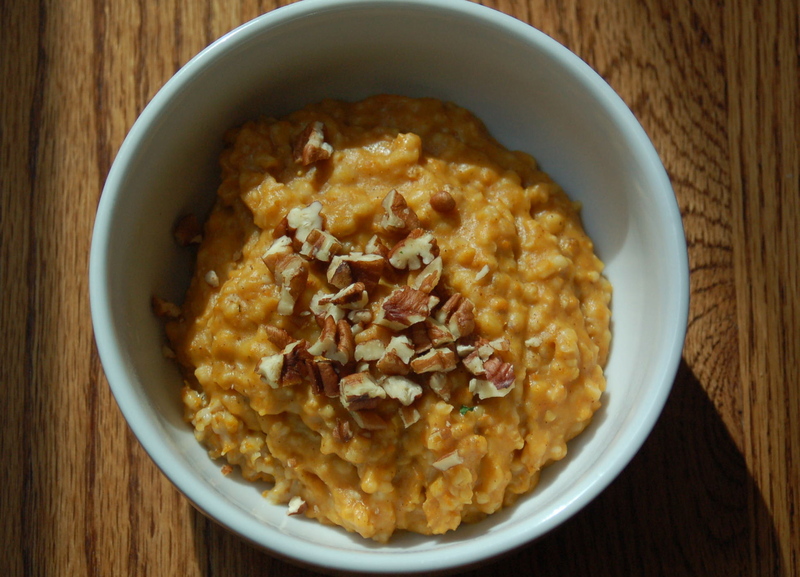 Fill the slow cooker with water covering the pumpkin oatmeal bowl at least half way. Cover and cook on a low temperature for 7 hours. Start the slow cooker before you go to bed and wake up to perfectly cooked oatmeal. Give the oatmeal a thorough stir before serving. Fill the slow cooker insert with enough water to cover the oven proof bowl half way. This is what the oatmeal will look when it’s finished cooking. Give it a thorough stir before serving. 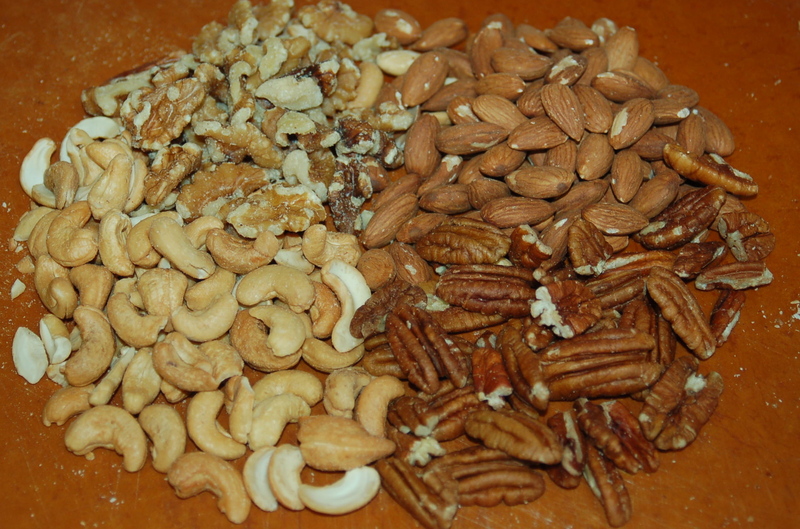 If you prefer, serve with chopped nuts (i.e., walnuts or almonds) and / or with fresh fruit (i.e., diced apple or sliced banana). The leftover oatmeal and be stored in individual serving size containers in the refrigerator. 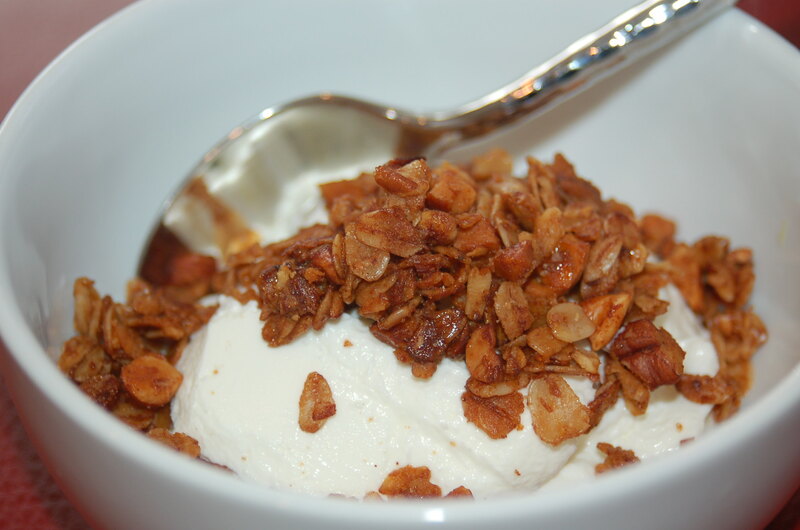 Add a little almond milk to loosen up the oatmeal and warm it up in the microwave when you are ready to eat it. I love winter fruits and vegetables. Last week one of my ultra running pals brought me a big stalk of Brussels sprouts. 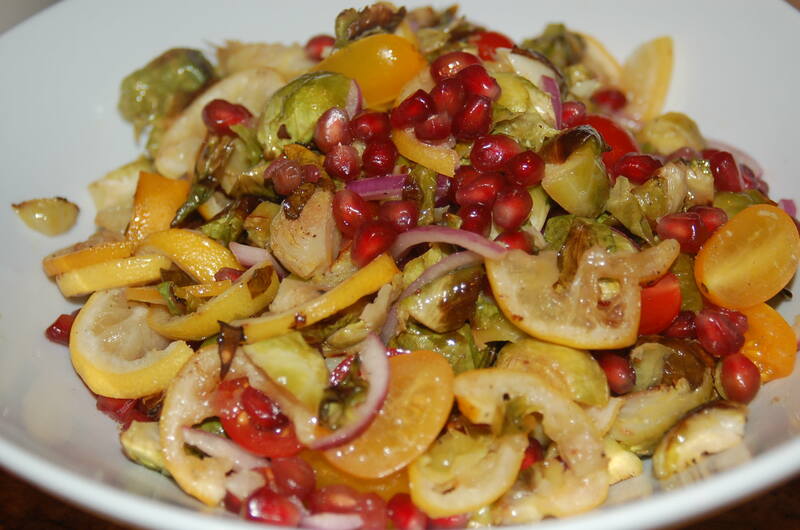 I knew right away I wanted to make some sort of Brussels sprout salad and searched for a couple other winter vegetables or fruits that would brighten it up with some sweetness and acidity. I found those bright notes in a pomegranate and some lemons plucked from a tree in the back yard. 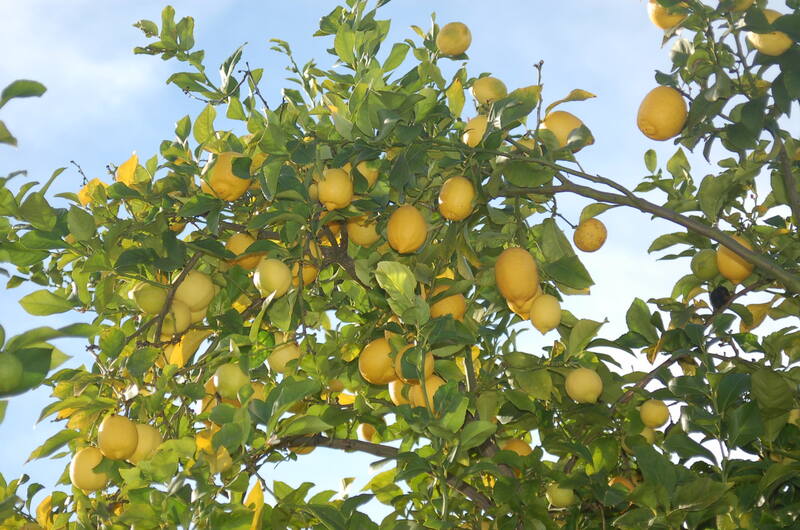 An abundance of lemons this winter. I absolutely love not having to buy lemons. The whole lemon is used in this recipe. Blanching the lemons, then roasting them, helps to eliminate the bitterness from the rind. You may be hesitant to bite into the lemon, rind and all, but you’ll be pleased to find the rind quite tender. You will want to try this because the peel of a lemon contains more vitamins than it’s juice. 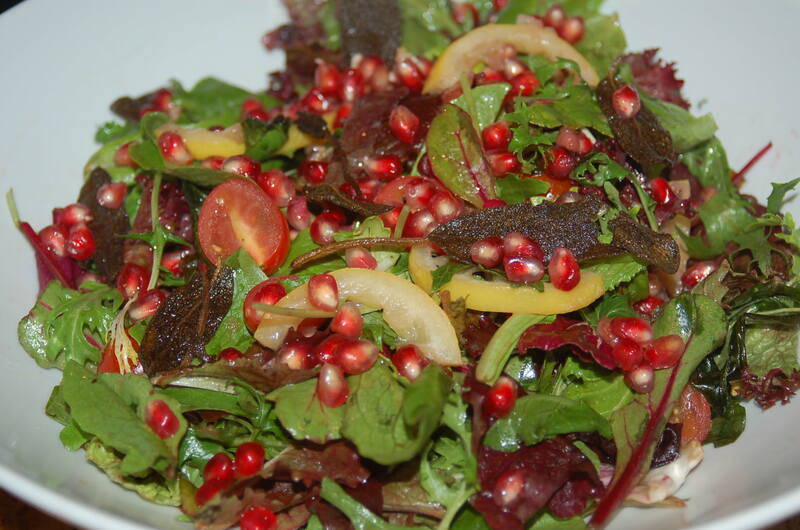 Lemon peels are an excellent source of fiber, potassium, magnesium, calcium, folate, beta carotene and vitamin C.
The lemons, pomegranate anvils and Brussels sprouts are tossed together with red onion and tomatoes to create a side salad that was not only visually bright but is also cheerful with each bite. Cut the Brussels sprouts in half and place onto 2/3 of a baking sheet lined with aluminum foil. Leave the other 1/3 of the baking sheet empty. Lemon slices will be added to this space later. Toss the Brussels sprouts in 2 tablespoons of olive oil, then season well with salt and pepper. Roast the Brussels sprouts for about 20-25 minutes until tender and the edges are brown. Turn over the Brussels sprouts a few times while roasting to ensure even browning. While the Brussels sprouts are roasting, wash the lemons well then slice one lemon into thin rounds. Place the lemon slices into a pot of boiling water. Blanch the lemon slices for 2 minutes. This will help to eliminate the bitterness from the rind. Remove the lemon slices from the boiling water and add it to the baking sheet with the Brussels sprouts. 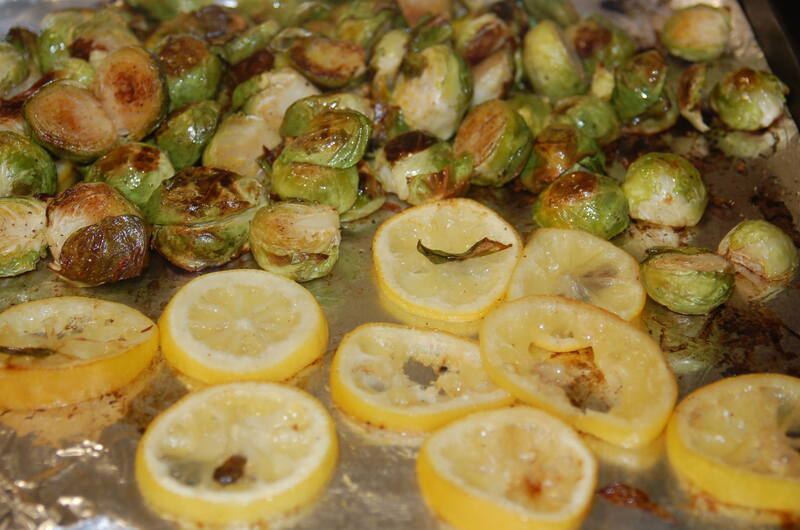 Coat the lemon slices in 1 tablespoon of olive oil then roast with the Brussels sprouts. Roast the lemon slices for about 10-15 minutes until they start to caramelize a little. Watch the Brussels sprouts and lemon slices carefully. The lemon slices may need to be removed from the baking sheet before the Brussels sprouts have finished roasting. Allow the Brussels sprouts and lemon slices to cool slightly, then cut both Brussels sprouts and lemon slices in half. In a measuring cup or small bowl, prepare the dressing by whisking together the remaining 1/4 cup of olive oil, the juice of the remaining lemon (about 1/4 cup), balsamic vinegar, honey and a pinch of salt and pepper. In a medium bowl, toss the Brussels sprouts, tomatoes and red onion slices in the dressing. Transfer to a serving bowl. Slice the lemon rounds in half and add to the top of the Brussels sprout salad. Top with the pomegranate arils. Swap out the Brussels sprouts with mixed greens for a salad with brightness in every bite. My Asian Pasta Salad is one of my go-to recipes when I need a dish that can be prepared in advance and left sitting at room temperature for a few hours without refrigeration. I make this dish for picnics, to bring to work for lunch and most recently at this weekend’s Super Bowl party. 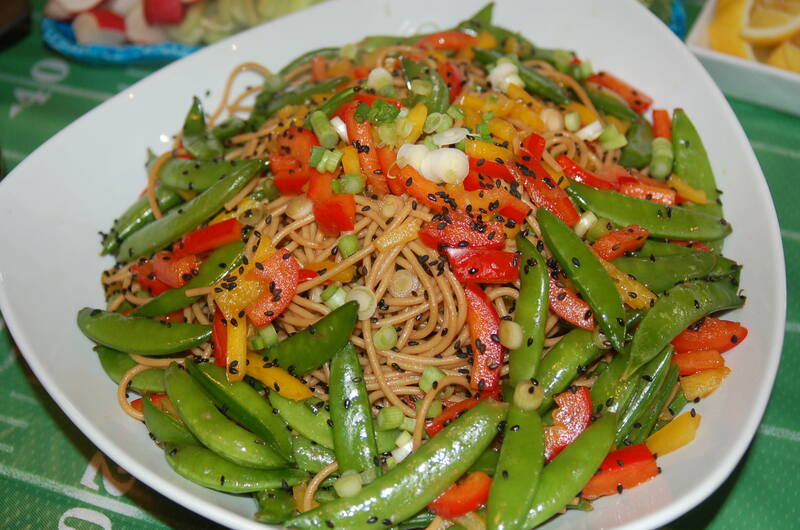 This recipe includes one of my favorite vegetables, the sugar snap pea. Developed in 1979, the sugar snap pea is a relatively new food, and a hybrid of green peas and snow peas. They are sweet, crunchy, easy to chew, and a good source of fiber, iron, potassium and vitamin C.
Cook the pasta noodles in salted boiling water, stirring frequently during the first couple of minutes, then occasionally to ensure the noodles do not stick together. Cook it until it is “al dente”. Drain and rinse in cold water to stop the cooking process. Place in large mixing bowl. 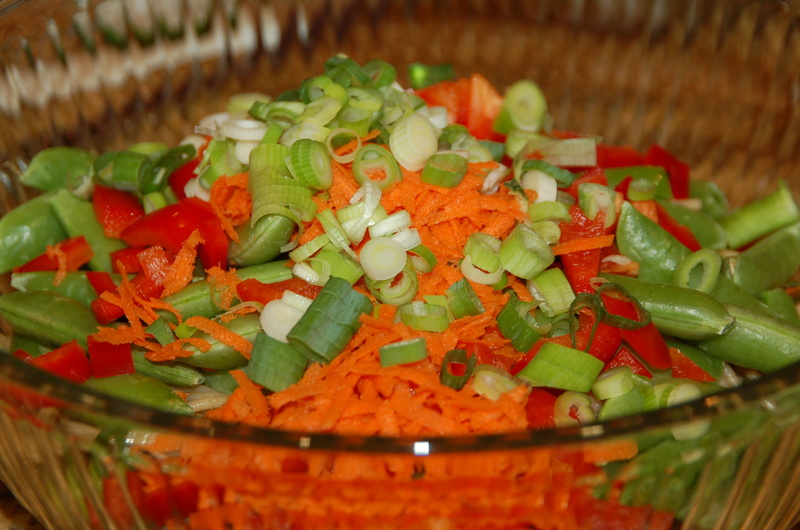 Add carrots, peppers and sugar snap peas to the pasta bowl. 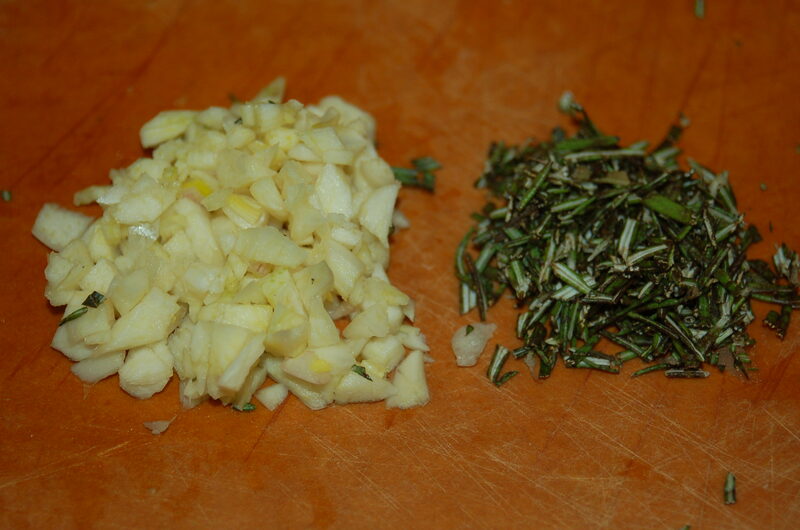 Reserve a tablespoon of scallions to use for garnish later and add the rest of the scallions to the pasta bowl. In a measuring cup or small bowl, whisk together soy sauce, chili oil, vinegar, grated ginger, canola oil and sesame oil. 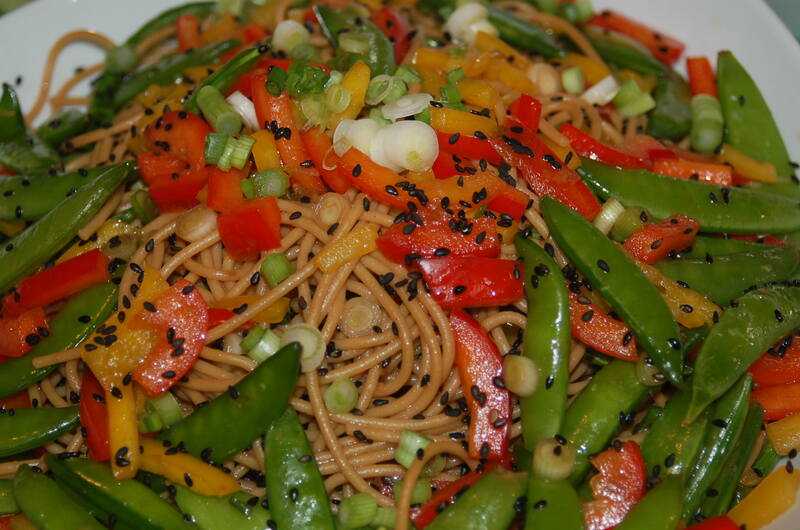 Reserve 1 teaspoon of sesame seeds to use for garnish later and add the rest to the soy sauce dressing. Add the dressing to the pasta bowl and toss thoroughly to ensure all the pasta and vegetables are coated with the dressing. Sometimes it’s easier to use clean hands to toss the pasta. The pasta can be served immediately, however I like to cover it and let it sit in the refrigerator for a couple hours to give the pasta a chance to absorb the dressing. Toss the pasta after removing it from the refrigerator. Sprinkle with reserved scallions and sesame seeds before serving. My Curry Butternut Squash & Cauliflower Soup, with a little heat from cayenne pepper, warms the soul on cold winter days. This soup is made with two nutrient dense vegetables, which are low in fat, low in carbohydrates and high in dietary fiber. Winning! Technically a fruit, the butternut squash has a particularly high level of vitamin A and also has a high level of vitamin C. It has more potassium than a banana and its color indicates an abundance of carotenoids, which is believed to protect against heart disease. When buying butternut squash, select the fruit that feels heavy for its size with a matte and unblemished skin. A glossy skin indicates that the squash was picked too early and will not be as sweet. Stored in a cool dry place with ventilation, not in the refrigerator, this fruit has a storage life of up to three months! In an effort to increase the nutritional value of my recipes, I like to incorporate a variety of vegetables. For this soup, I paired the butternut squash with cauliflower. Cauliflower is a good source of vitamin C and contains folate. 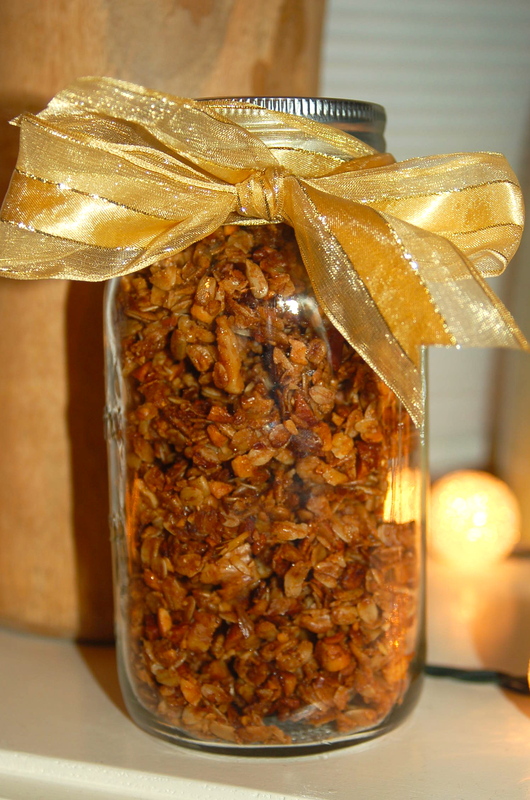 It is also a good source of minerals, including iron, calcium and potassium. 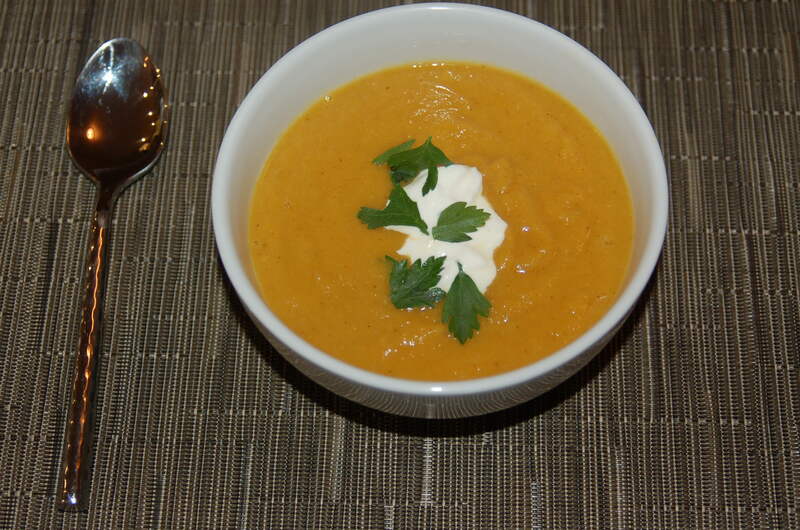 I prefer to roast the butternut squash, cauliflower and apple rather than boiling them to make this soup. Roasting is one of my favorite ways to cook vegetables and allows the flavors to develop and intensify. I used a Dutch oven and an immersion blender to make this soup however you can use a blender too. I do recommend investing in an inexpensive immersion blender. They are easy to clean up and you can use it while the soup is still in the pot. 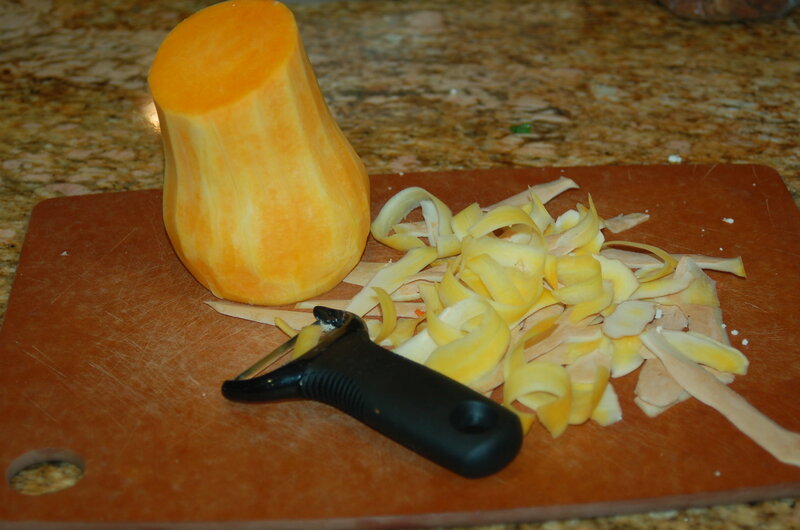 When preparing the butternut squash, use a very sharp knife. Cut a thin layer off the top and bottom to create a level surface. Then remove the skin using a vegetable peeler and scrape the seeds out with a spoon. When cutting the squash, cauliflower and apple, try to create even pieces. This will ensure even roasting. 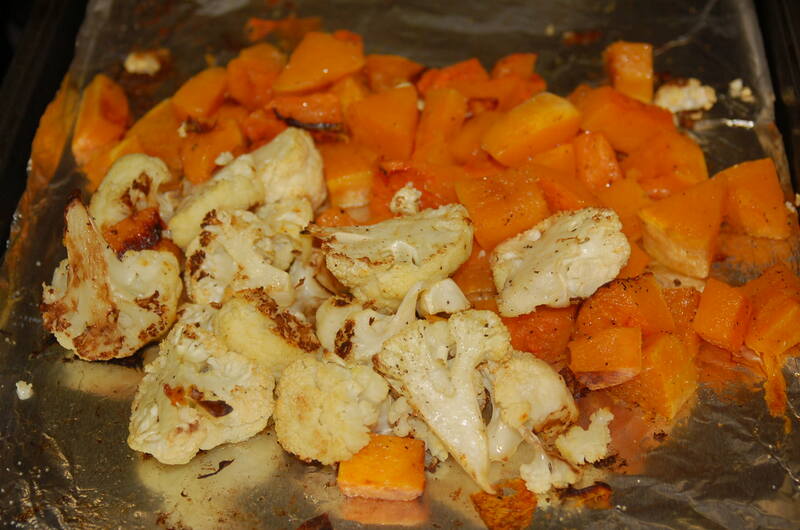 Toss butternut squash, cauliflower and apple in 2 tablespoons olive oil. 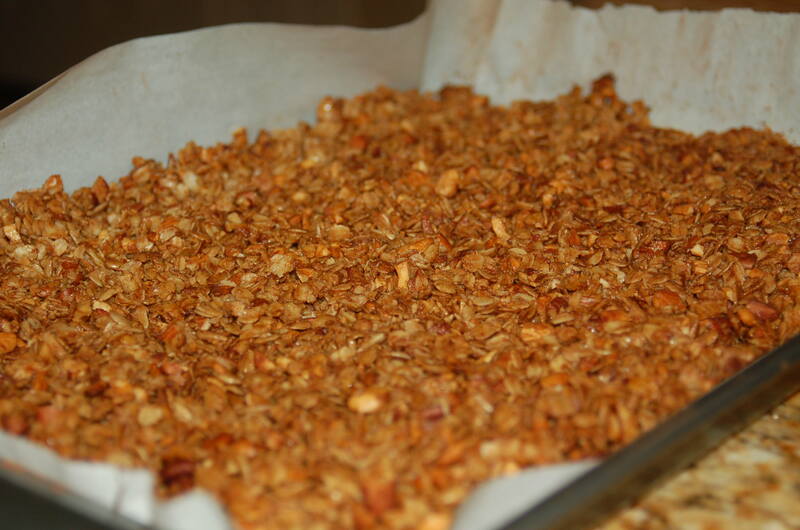 Place on baking sheet lined with aluminum foil. Season with salt and pepper and roast in 400F oven for about 25-30 minutes until tender. Turn the fruits and vegetable over at least once to ensure even roasting. 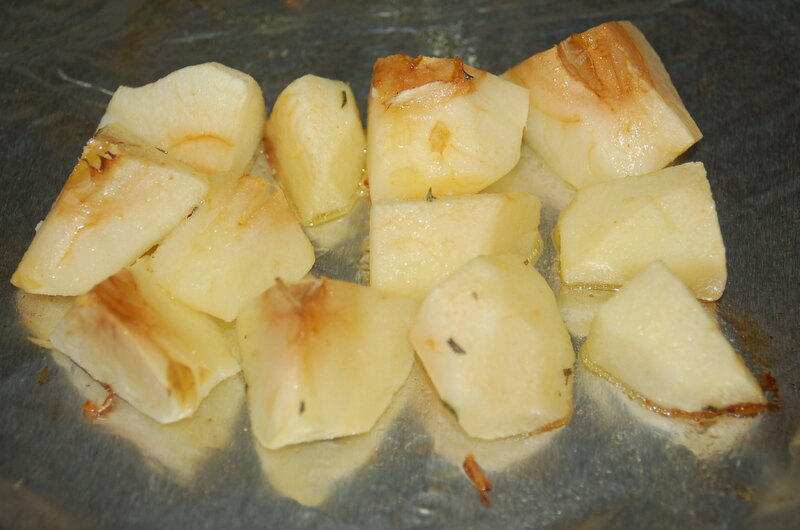 You may need to remove the apple cubes before the butternut squash or cauliflower is finished roasting. 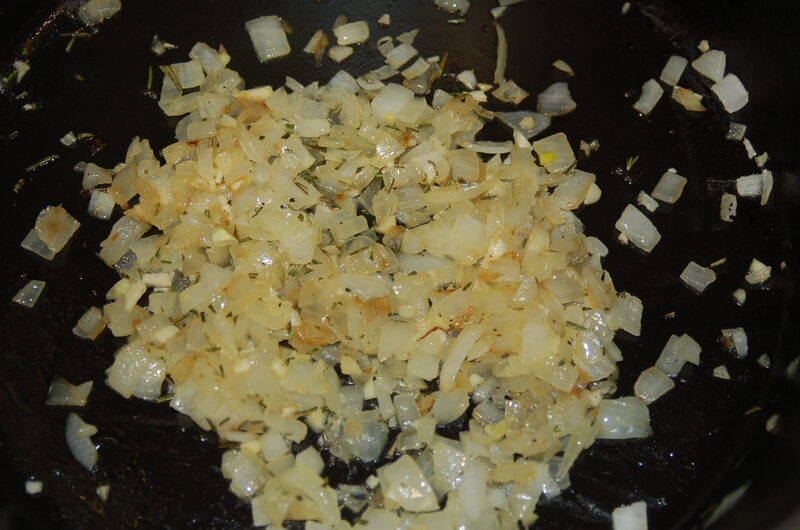 In a Dutch oven, sauté onion in 1 tablespoon olive oil until tender and translucent. Add garlic cloves, rosemary, curry powder, salt, cumin and cayenne pepper and sauté for another couple of minutes. Remove the onion mixture from heat if the fruits and vegetables are not done roasting to avoid burning the onion and garlic. Once the butternut squash, cauliflower and apple are done roasting, add them to the onion mixture. Add vegetable broth and honey. Simmer for 15 minutes. Using an immersion blender, puree the mixture until smooth. You can also use a blender. If using a blender, add only a couple ladles full of soup at a time. Place a kitchen towel over the lid and hold down with your hand. This is to prevent the hot liquid from pushing out of the lid and burning your hand. Gently pulse to start, then blend until smooth. Taste soup and adjust seasoning to your liking. Serve with a dollop of crème fraiche on top and garnish with fresh parsley.